A church that is loving , caring and serving so that all may have the fullness of life; seeking holiness, maturity and integral evangelization; proclaiming and living witness to the values of God’s Kingdom. Undertake formation programs for conscientization, skills upgrading, better coordination and animation, and the protection of life. The early works in the Diocese of Myitkyina dated back to the time of the great legendary missionary Bishop Paul Ambrose Bigandet, M.E.P., who was then the Vicar Apostolic of Ava and Pegu. Bishop Bigandet himself visited this far- flung northern territory in 1856. When Bishop C. Bourdon was consecrated Vicar Apostolic of Northern Burma in 1873, the first thing he did was send Rev. Fr. Biet to Banmaw (Bhamo). Rev. Fr. Liyet and Rev Fr. Lecomte followed within a short space of time. The start was good but unfortunately cerlebral malaria (black water fever) was rampant and for thirty years the work did not progress much. From 1873 to 1901, a total of 14 priests either died or returned wrecked in health. In 1903, Fr. Charles Gilhordes founded Hkudung village, 30 miles North- east of Banmaw. From here the Catholic mission among the Kachins was destined to grow. The two outstanding missionaries in this period were Fr. Gilhordes (+1945) among the Kachins and Fr Roche (+ 1941) among the Shan-Chinese. However, the great missionary endeavour of the early M.E.P. Fathers was hampered by malaria that infested the region. increased to 38 barely two years after the arrival of the first batch. In 1939, the Holy See formally erected the districts of Banmaw, Myitkyina and Katha into the Prefecture Apostolic of Banmaw; and Rev. Fr. Patrick Usher was named the first Prefect Apostolic. The Second World War disrupted the growing mission activities of Banmaw. The dauntless and courageous Msgr. P. Usher died in 1958; consoled by the splendid recovery of the missions after the devastating war years, a good hope for the future of the Church in Banmaw-Myitkyina area began to bloom. The Vicar Delegate and Pro Prefect Rev. Fr. John Howe succeeded Msgr. Usher and a magnificent church was built in Banmaw under the supervision of Rev. Fr. James Cloonan. Archbishop J.R. Knox, who was then the Apostolic Delegate for Myanmar, blessed the Church in 1960. In 1961, the Prefecture Apostolic was erected into the Diocese of Myitkyina and in the same year Msgr. John Howe was consecrated Bishop of Myitkyina by His Grace Archbishop J. U Win of Mandalay. On March 27, 1965, Msgr. Howe and the indeginous people in the diocese had one of their greatest joys in ordaining the first Kachin Priest in the person of Paul Zinghtung Grawng. Soon after the turn of events in 1965 and 1966, the Columban Fathers began to concretely prepare for handing over the care of the diocese to the local clergy and people. They chose and trained priests, religious, catechists and the faithful for the seminary, catechist school, the liturgy, religious instruction and formation ect. On April 3 , 1976, Bishop Howe, with the mandate and blessing of His Holiness Pope Paul VI, ordained Fr. Paul Zinghtung Grawng as his Auxiliary Bishop. The following year he handed over the diocese to the indigenous clergy who then numbered only 10 and left for his home land. The rest of the Columban Fathers withdrew completely in 1979; gratefully acknowledging the merciful love of God, implanting His Kingdom in the hearts of the people, they entrusted it to Him who they knew would bring to completion the work that they had strived to do with His love. The Diocese of Myitkyina, like any other diocese in the country did not simply enjoy a smooth-sailing ride as far as her missionary activities are concerned. Rough and tough situations often paved the way and the little band of young and energetic clergy found enough courage to blaze the trail and carry the Gospel message to remote and hazardous areas. Today after all those hard years of worries and anxieties, pain and toil, suffering and anguish, the diocese has increased in the number of clergy and faithful. Salvatore Pennacchio, Apostolic Nuncio for Myanmar officiated the installation of His Excellency Bishop Francis Daw Tang on February 6, 2005. Archbishop Paul Grawng (of Mandalay) and Archbishop Charles Bo (of Yangon) were present to witness the ceremony. Some other bishops, Columban priests, Marists, local priests, religious, and many faithful graced the cel-ebration. In view of the growth of the local Church, the Holy Father Pope Benedict XVI divided the Diocese of Myitkyina into two and created a new and smaller diocese known as Banmaw Diocese. Thus, the opening of the establishment of a new diocese was celebrated on November 17, 2006. 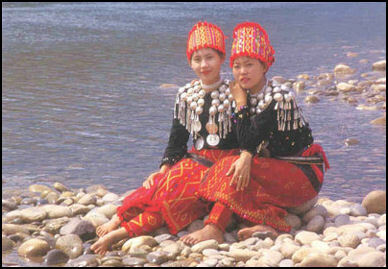 Banmaw is situated in the Sought Eastern side of Myitkyina. Rev. 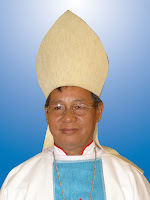 Father Raymond Sumlut Gam was ordained as the new bishop of the Diocese of Banmaw the next day, that is ,November 18, 2006. His Grace Archbishop Salvatore Pennacchio represented His Holiness Pope Benedict XVI to the creation of the new diocese and the ordination of the new bishop. Homilin, which lies in the Eastern Frontiers of the Diocese of Hakha in Sagaing Division, was formally incorporated into the Dicoese of Myitkyina in June 2011.